Oedipus: King of Thebes, son of Laius and Jocasta. He was destined to sleep with his mother and kill his father. Creon: Brother of Jocasta and brother in law of Oedipus. Jocasta: Husbad of Lauis and Oedipus. Mother of Oedipus and sister of Creon. Tiresias: A famous blind prophet of thebes who can see the future and predict fate. The chorus: The elders of Thebes who reacts to every event as they happen. Antigone and Ismene: Child of Jocasta, Oedipus and Lauis. Sister of Oedipus. Lauis: Husband of Jocasta and Father of Oedipus. Dies early in the book. 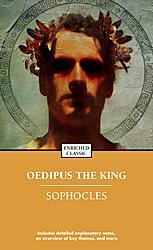 In the book, Oedipus is born with a prophecy to kill his own father (Lauis) and marry his mother (Jocasta). Oedipus's father Lauis tries to prevent this from happening by ordering the baby (Oedipus) to be killed but instead Oedipus is given to a childless king and queen who raise him as if he was his own. As Oedipus gets older he runs away and ends up in Thebes. To get to Thebes he killed Lauis, unknowingly that he was the king of Thebes, let alone his own father. He then becomes ruler of Thebes and marries his mother (Jocasta). He finally realizes what has happened and punishes himself by stabing out his eyes. As well as Jocasta does, but instead she hangs herself instead. The scene where Oedipus and Jocasta punish themselves is very important. When Jocasta hangs herself to death and Oedipus realizes he tries to loosen the rope. He then sees her lying dead on the floor and rips out the golden pins on her, which her clothes were fastened with. Raised them above his head and stabs himself repeatedly. At this point he has &#8220;a dark shower of it, thick as a hailstorm&#8221; running down his face. In this scene Oedipus realizes that he doesn't want to see what he's done, or as if he deserves to see anything at all. He feels as if there is nothing else left for him to see and he wishes he would of died back when he was supposed to be murdered.